Found 2 file extension associations related to TextExpander and 2 file formats developed specifically for use with TextExpander. TextExpander is a text productivity tool that can be used to save various texts under shortcuts to quickly write them down when needed. 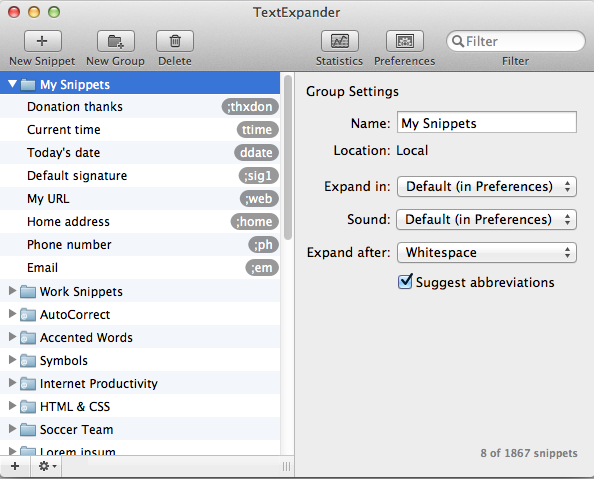 Save time and effort with TextExpander! Whether it's a simple email signature or several paragraphs of a standard response, you'll love how easy it is to use TextExpander to avoid typing the same thing over and over. Assign hotkeys to save even more time when creating, editing and searching your snippets. Reposition the cursor in the expanded snippet, or use our new fill-in-the-blank snippets to enter variable data in multiple fields. If you need more information please contact the developers of TextExpander (SmileOnMyMac, LLC), or check out their product website.